The first mention of the name Jardine is contained in Hollingshead's Chronicles of England as one of the Normandic knights that fought for William at the Battle of Hastings (AD 1066). There is also evidence that may suggest that the Jardines were of Norse extraction that migrated to Normandy with a warrior named Rollo prior to 1066. At some point in time the name or its meaning appears to have been translated into English. Patrick de Gardinus was chaplain to the Bishop of Glasgow and there is a signature on a document from 1245 of Sir Humphrey de Gardino. To add to the confusion Jorden del Orchard's signature appears on the Ragman Rolls of 1296. Later Humphery de Jardine's name appears on a charter drawn up by Robert the Bruce. Wars of Scottish Independence: Unlike many Scottish clans during the Wars of Scottish Independence the Clan Jardine are said to have fought against William Wallace and in support of the English at the Battle of Stirling Bridge in 1297 and the Battle of Falkirk (1298). However the Clan Jardine supported King Robert the Bruce at the Battle of Bannockburn in 1311 where they helped the Scottish King defeat the English. 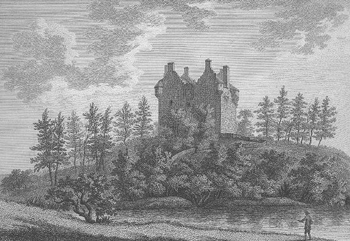 During the 14th century the Clan Jardine settled in Applegirth in Dumfriesshire. There they built Spedlins Tower which was the family's seat until the 17th century when Jardine Hall was built on the opposite banks of the River Annan. 16th Century and Anglo Scottish Wars: The border region between England and Scotland was a difficult place to live. There were constant raids and incursions by both sides. Chief Sir Alexander Jardine of Applegirth led the clan when they met an advancing force of English near Carlisle in 1524 where they took hundreds of English prisoners during the Anglo-Scottish Wars. In 1547 the tables were turned when Alexander's son, the next chief, had to deal with over 5,000 English who overran the area, sacking the Jardine lands and forcing John Jardine of Applegirth to yield. John later sought assistance from the French and along with the Clan Jardine fell on their English oppressors taking many lives. The Clan Jardine also supported the cause of Mary, Queen of Scots, however her scandalous marriage to Bothwell after the suspicious murder of Lord Darnley turned the Jardines along with many other Scots to support her infant son James's claim to the throne. 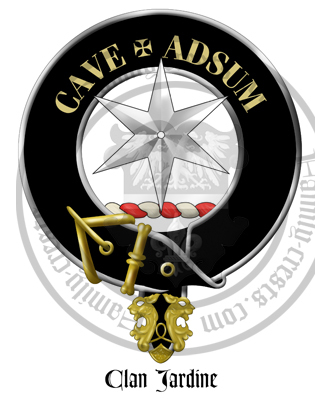 17th Century: A later Sir Alexander Jardine forged a link to the powerful Clan Douglas through marriage to Lady Margaret Douglas, sister of the first Duke of Queensberry. They had a son, Alexander, in 1645, who was later created a Baronet of Nova Scotia. 18th Century: The fourth Baronet was a Knight of the Sovereign Order of Malta, taking a vow of celibacy. When he died in 1790 the title passed to his brother, Sir William. Jardines also made their mark on the literary world. Reverend John Jardine, born in 1716 mixed in the intellectual heart of Edinburgh during the Scottish Enlightenment had the good fortune to be part of a society that included great Scots such as economist and writer Adam Smith, philosopher David Hume, and the painter Allan Ramsay. He was one of the founders of The Edinburgh Review. His son, Sir Henry Jardine, was one of those present when the Honours of Scotland were re-discovered in 1818. He was knighted in 1825 and later made a Fellow of the Royal Society of Edinburgh. Arms: Argent, a saltire and chief gules, the last charged with three mullets of the field. Supporters: Dexter, a horse at liberty argent; sinister, a man in armour having a scymitar at his side all proper. The seat of the Chief of Clan Jardine is once again at Spedlins Tower. Spedlins Tower is situated by the River Annan, 4 miles (6.5km) northwest of Lockerbie. It is a 15th century building which was re-roofed and re-occupied in the 1960's. The seat of the Jardines has been at Spedlins since the late 12th Century. The tower had become a ruin after the Jardines built a new mansion, Jardine Hall nearby.